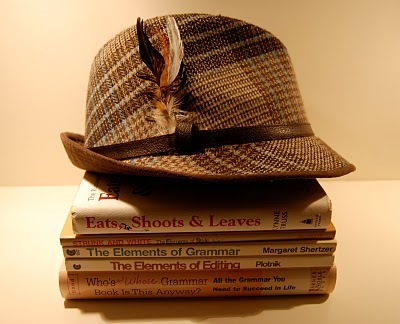 It's Thursday--time for me to put on my English teacher hat! Several readers have asked me to explain the correct usage of punctuation marks and quotation marks. Like many of the issues I'll tackle in this series, this particular problem affects only our writing. We have no problem with punctuation issues when we speak--we use our voices to indicate pauses, emphasis, etc. But when we write, we depend upon punctuation in order to communicate clearly. Place commas and periods (full stops) INSIDE quotation marks. "I'm so glad you can come to the party," said Rachel. "It sounds like fun," answered Susan. "Thanks for inviting me." Special note: If you need to include parenthetical material after the direct quotation, simply enclose the words of the quotation in quotation marks, list the parenthetical statement, and then place the closing punctuation. For example: Jesus said, "I am the way, the truth, and the life" (John 14:6). Place colons and semi-colons OUTSIDE quotation marks. I've never listened to all of "Stairway to Heaven"; I always turn it off before it's finished. The singer listed four key elements to what she calls "The Road to the Grammies": talent, dedication, perseverance, and good breaks. Question marks and exclamation points should be placed inside the quotation marks only if they are part of the quotation (that is, if the actual quotation is a question or an exclamation). If the whole sentence, not the quotation, is the question or exclamation, simply enclose the quotation with no ending punctuation and place the question mark or exclamation point outside the quotation marks. "Can I help you?" asked the clerk. Does the receptionist always answer the phone by saying, "It's a great day at Johnson's Fitness Center"? "I can't wait!" shouted the boy. I am so excited that RCA is going to re-release my favorite Elvis song, "How Great Thou Art"! Sometimes you'll want to include a quotation inside a larger quotation. For instance, you may be writing out what a person said, and part of what she said is an item that should be in quotation marks. In that case, you use single quotation marks (same keyboard stroke as the apostrophe) to enclose the inside quotation and regular quotation marks to enclose the entire quotation. "Have you seen the 'Serenity Now' episode of Seinfeld?" asked Amanda. I hope this is helpful to you. As always, I'd be happy to answer any specific questions you may have. If there's a grammatical issue you'd like for me to write about, please let me know. If there's a particular question you'd like for me to answer right away, email me (richella (at) gmail (dot) com). I love you. This is one of my biggest pet-peeves when it comes to punctuation. And you got it perfectly right! Thank you! Thanks for posting this! I've noticed that I needed a refresher lately. Great post to refresh our writing. This was an awesome refresher, as sometimes I just make up my own rules when I don't remember. ;) I love secret blog messages...bwahaha. Another great lesson! You make it so clear and easy to understand. Leslie queried, "You never have listened to 'Stairway to Heaven' in its entirety? I am aghast!" I need these reminders so very terribly! THANK YOU! THANK YOU! THANK YOU! I avoid quotation marks for exactly this reason. I always question myself on the puctuation. You rock Richella! I've bookmarked this for future reference! LOL! I spent many hours teaching 4th and 5th graders how to use quotation marks. Thanks for visiting, and leaving a sweet comment. I, too, love The Mitford Series!